Seems like the first day of Fall is tomorrow, and it's hard to believe the summer has passed so quickly. 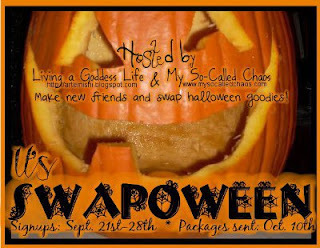 To get in the spirit, I signed up for a Halloween blog swap. You can sign up anytime between now and September 28th, and how much fun will it be to swap boxes of Halloween themed goodies? Here is where you'll find the two hosts - My So Called Chaos and Living A Goddess Life. Thanks Lisa, I am going to check it out. This sounds like fun! I won't do it since shipping is too much to and from Canada, but maybe I'll see if any other Canuck ladies want to do this. Soo excited to see what you send and get!! I am swapping too! I am following you now! What a neat idea. I'll think it over. Thanks for sharing it! I'm soooo excited that you're playing along! :) Thanks for signing up! Oh that does sound like fun! this sounds like fun for those 3 little cuties of yours!! halloween is not as much fun when you don't have little ones anymore!! That sounds so fun! I will go look right now.